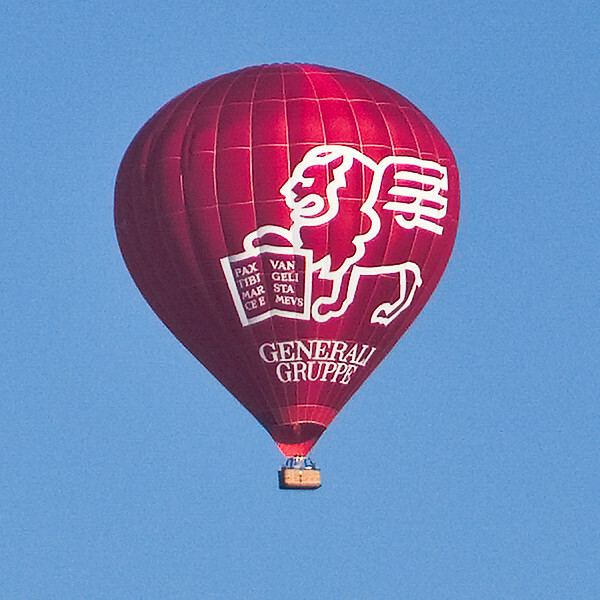 And then I saw a red balloon in the distance. Shot freehand with a Pentax K-7 and a FA* 300/4.5 lens. You may click on the image above to view it in original size and see that the opening image actually is nothing but a 100% crop from this very image. You actually can see heads more than 3 km or 2 miles away (as I later computed). This is just a short essay about 5 ergonomic details in the K-7 which may create worries. The K20D has a clearly visible SR button which is missing in the K-7. The following sequence is required in the K-7 to switch SR on or off. First, lets define how I call the buttons around the OK button: "8", "4", "5", "6", "2", like on a numeric keypad, with "5" being the OK-button itself ("8" is the drive button on top of "5"). Because SR is switched off automatically, e.g., on a tripod with remote control, this omission is no big deal. The K20D has an exposure bracket button which serves to quickly enable exposure bracket using the two dials to set #images and EV distance in between. So, it is 4 button presses to activate and de-activate. If used often, one can live withit. But it is a lot less fun to set than with the K20D. Again, this omission is no deal breaker though. Not being a heavy user of AF point selection, I can live with pressing OK prior to AF point selection. A user which relies on AF point selection however, will not understand why the logics isn't inverted as soon as you dial into AF point "SEL" mode. Because now, a change of AF point is much more frequent than, e.g., a change of drive mode. So I really hope that Pentax adds a custom setting which makes AF selection the default in "SEL" AF point mode where pressing OK acts like Fn. As of today (July 29, 2009), Pentax has released a firmware update (v.1.01) which adds exactly the behaviour as described above as an option. Now, AF point selection can be used like with a K20D (i.e., the OK button will act as mode switch, not as middle AF point selector). Pentax, thank you for listening! The mode dial of the K-7 on the left side controls mode such as P, Av etc. In order to prevent that it can be changed inadvertently, it got a button in the middle to lock it. It must be pressed in order to turn the dial. I developped a technique using three fingers from my left hand: the index finger presses the lock while the two neighboring fingers (one is the thumb) turn. Any other technique including using two hands (the obvious choice) turned out to create headaches. Engaging it will more probably lead to an inadverted change of the exposure meter mode (the level right underneath!) than the mode would change w/o the mdlb. And this inadverted change passes unnotices most of the time! Therefore, adding the mdlb and not removing the exposure meter mode level is a clear engineering mistake. So all of a sudden, mode changes are frequent. While it was ok to stay in Av mode for ages with, e.g., a K20D, you now have to always switch between video and Av modes. If you seriously use video, you'll soon do it blindly -- and change exposure meter mode sooner or later. I consider the mdlb to be a real nuisance. Pentax, please, take it back! Or make it toggle so we can leave it unlocked permanently. The info screen has changed. It is more useful now. But I found no way anymore to display the focal length of a zoom lens prior to a shot. With the exception of the mdlb, I like the new interface. And I didn't want to discuss the RAW button ;) The info button grants easy access to many quick changes. So, despite some weak points, I consider the overall button ergonomics of the K-7 even better than that of the K20D. Anyway, I really like the ergonomics of Pentax, in particular their hyperprogram and manual focus shift philosophy. This is a short video sequence shot at 1536 x 1024 with a Pentax K-7 during an oldtimer car meeting earlier this year near Munich. Pentax K-7 movie in 1080p from falconeye on Vimeo. 720p video is 1280x720, 1080p video is 1920x1080, both in 16:9 aspect ratio. The native video capture is in 1536x1024 or 3:2 aspect ratio. 1536x1024 -> 720p: magnify by 83.33%, crop 8.00% from upper and lower edge each. 1536x1024 -> 1080p: magnify by 125%, crop 7.81% (100px) from upper and lower edge each. There is no benefit in recording in 720p directly, except for a better control of framing (16:9 framing on rear display) and smaller file sizes. For 720p, the camera does the same supersampling to 83% size one would do in post-processing otherwise. On the other side, keeping the 1536x1024 material provides some more options for post-processing. 1536x1024 material is not suitable for direct presentation. Here, 720p is a better option. Most video editing software will directly open the AVI file stored on SD card. Additionally, Apple Quicktime will open the file and Quicktime Pro allows to extract individual or all frames as images. Or to recode the movie, e.g., to MP4 AVC H.264. Photoshop CS3/CS4 can open the AVI file directly as well and you get a video layer. There, you can do many image operations like you do for still images and recode, e.g., again to MP4. After touching up the raw material, I used Adobe Premiere Elements for more video-oriented editing. On the Apple, MacOSX has something similiar on board, called iMovie. The K-7 captures stunning video quality. But it isn't good enough to justify the extra size coming with 1080p, compared to 720p. At least not without further touching up the quality. Below, you'll see two frame images from the short clip above. The first is as out of the camera. The second image is post-processed using my K-7 video IQ master (a program which I developed to defeat the "768-aliasing artifact"). The K-7 video IQ master is work in progress and yet unpublished. The basic idea is to use the insight about the submatrix as described in part I and try to correct some of the weaknesses in the original algorithm as built into the camera. You may have to click onto the images to see the original size to study the difference. According to several opinions, the filtered footage has less fringing and less jaggy lines while still gaining (or at least maintaining) on overall detail (read: without becoming softer). It was used to create the 1080p clip in the opening of the article. I hope that a forthcoming version of the K-7 video IQ master will be good enough to render 1080p footage to the same stunning quality we now see in 720p footage. And further improve on 720p quality. Btw, I very much welcome any comments on this topic. As a side note. It is no problem to add motion blur to frames belonging to a panning action. Or tilt to remove the skew. Just open the corresponding video sequence in CS3. This shall conclude my three part article about the video capabilities of the Pentax K-7. 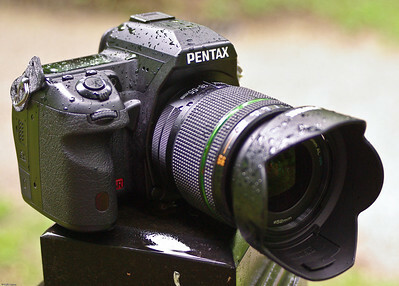 The video mode in the Pentax K-7 looks like a very promising proposition. It can produce stunning video quality, esp. in 720p. However, Pentax made a number of trade-offs to keep the camera affordable as a still camera (and it is a high spec camera already w/o video). Therefore, to achieve maximum possible quality in movies, a number of tweaks applied during capture and in post-processing are of help. 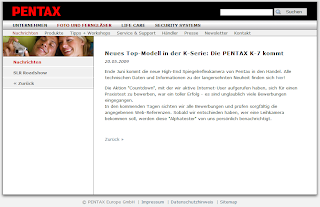 In part I, we have discussed the technical implementation of the video feature in the Pentax K-7. Now, let's see how to make good use of it. Again, I'm not going to repeat the specification or user's guide. At first glance, it seems to be very straight-forward: Turn the mode dial to movie and press the shutter! Ok, done this, been there. Now, for the more serious fun: how do we control shooting parameters? Autofocus, aperture and E/V-compensation can be set prior to a recording. All three are defunct while recording. Of course, the camera won't complain if you change aperture or focus manually (read: mechanically). The focus in video mode is contrast autofocus by default. But you can switch to phase autofocus which is faster. The exposure (with all its parameters) can be locked/unlocked before and during a recording, using the AE-L button. EV values in video and still image modes seem to be the same. How to read the table: Look up the aperture in the upper left (e.g., f/5.6, marked in bold), search the measured light value in the corresponding column (e.g., EV 10) and look up shutter speed and ISO in the same row (e.g., 1/30s, ISO 100). I didn't research much how aperture would be controlled if set to AUTO. But it will choose a combination from the diagonal line of constant EV in the table above. In AUTO, the aperture is controlled live and you can hear the aperture blades moving! IMHO, this is a cool feature for a dSLR with a legacy SLR lens! (Update) I had another look at this. 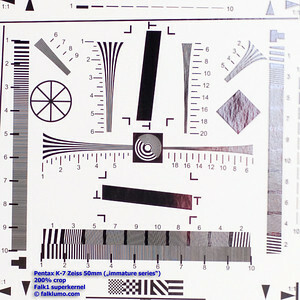 (*) estimated from diameter left open by aperture blades, as seen thru the front lens element. Note: The above table may not be fully accurate. E.g., the sweet spot shutter speed (1/30s) may be shorter, like 1/50s, actually. Note that many videographers prefer a shutter speed of 1/30s or 1/50s (i.e., the motion blur from it) for 30fps footage to minimize a stuttering effect in panning action. Also note that all this is from my own research. 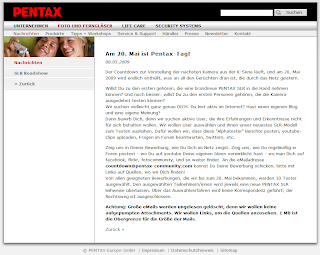 Pentax doesn't disclose the information given above and the recorded video contains no useful meta information. Now, using the response curve above, you can meter any subject, set the required aperture, use E/V-compensation to hit the required EV value, switch to movie mode (E/V compensation stays active! ), lock exposure with AE-L and you successfully manually controlled your video parameters! It is possible. But I agree that it is awkward in many if not most circumstances. If you need longer shutter times at daylight without wanting to stop down then you need to use a gray filter like you maybe would use for water still photography. Note that for video, you can stop fully down without loosing sharpness in the resulting video. However, what I did find very easy to use is the following trick: In video mode, before starting to record, I observe the live histogram on the rear display when pointing to different subjects which will emerge during a scene. Then I point to a "typical" histogram and lock exposure. Eventually, I record using these parameters. Autofocus stays inactive during recording (it was enabled up to firmware release 0.20). However, it is so slow and badly implemented that it wouldn't be useful in actual footage anyway. If you need to refocus using the autofocus, the fastest would be to set live view autofocus to phase detect and stop a recording (press the shutter again and wait ~2s), press the AF button (~1s) and start recording again (~1s). If there is no time for a ~5s break, then you must control focus manually. Unfortunately, magnifying live view is inactive during recording as well (and the view finder stays dark, of course). Fortunately, the quality of the rear screen with its 640x480 resolution allows an approximate focus. If the DoF effect isn't required, then shooting with fixed focus at hyperfocal distance is a viable option. The DoF calculations as obtained for an APS-C sensor do still apply. If you need to pixel peep, set circle of confusion to 0.015 mm. If you need more control over the focus, using either a field monitor or an enlarging eye piece looking at the rear screen may be an option. The K-7 outputs live view and life audio via HDMI in 480p, 576p, 720p or 1080p. 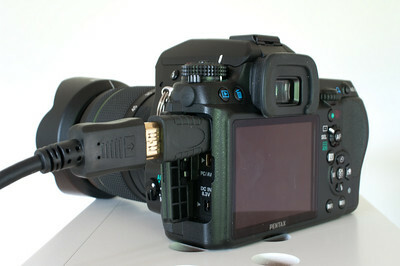 The image at the top of this article shows a K-7 hooked up to an HDMI 1.3 type C cable. However, the video data will always be 480p only, possibly enlarged to match the HDMI protocol. K-7 videographing its own live view from falconeye on Vimeo. The video above shows how the live feed from the K-7 behaves. In particular, you can assess the latency between reality and HDMI output. I guess it is about 1/3 s.
There are field monitors one can connect via HDMI and mount to the hot shoe or flash bar. The flash bar however, may be the better choice if a microphone is already mounted to the hot shoe ;) Because the feed is always 480p only, there would be no additional benefit in getting a 800x600 or 720p field monitor (this notice may not hold true for the Samsung GX30). A 5-6" 480p field monitor with HDMI input will do it. Avoid monitors with A/V analog input only. Field monitors may have a headphone jack for audio playback as well. Note that a wide angle lens has a closer hyperfocal distance and produces smoother panning as well. So, I just adopted wider lenses as my standard when videographing. The built-in mono microphone is very sensitive to environmental noise like wind. So, using an external (stereo) microphone is a much better option (or use external sound recording and a take board). I tried the RØDE Stereo VideoMic connected to the flash hot shoe and it produces excellent results. The recorded quality is definitely more than sufficient for voice and sound. For music one may want to record externally. Btw, there is no control of volume. But the recording level is relatively low and I didn't have any problems with either oversteer or noise floor. Now, let's go out and have fun with video. I.e., it is time for part III. One of the more exciting features of the K-7 is its ability to record video in HD. I will not repeat the specifications here. But it has an excellent 720p@30Hz recording mode and a 1536x1024p@30Hz mode which is almost full HD and can be used to create FullHD footage. In practice, it writes MJPEG at about 50 MBit/s and therefore can often outperform video recorded in AVCHD. Many would think that Nikon D90 was the first dSLR sporting HD video. But this is only true 50%. The earlier Pentax K20D already included the ability to record video at 1024p@21Hz, although limited to clips of 5.6s each. So, the video funtion in the K-7 is regarded as already being version 2 by many Pentaxians. I am the kind of person who needs to look under the hood. Driving is fun. But seeing and grabbing the engine underneath is fun too ;) Read what I've found out. First of all, video from a dSLR isn't a trivial thing to implement. Of course, one could read out all 14.6 raw million pixels 30 times a second (or at least 24) and construct the corresponding video frames, ideally by supersampling pixels into the smaller size, and compressing to a video codec. But this implies a tremendous processing load (i.e., processing 6.53 GBit/s raw input data in real time!). Implementing it this way (and I think Canon does it this way in their 5DmkII) makes the camera significantly more expensive than would have been required by still photography alone. Therefore, Pentax created a special subsampling mode where only every 6th raw pixel value is read out from the sensor at 30 Hz. This special signal is always used to create live view, zoomed live view and HD video frames, for all of Pentax K20D (21 Hz), Pentax K-7, Samsung GX20 (21 Hz), Samsung GX30 and Samsung NX' electronic view finder. Because an HD video has only 2 MPixels (or less) which is about only 1/6th of pixels of a 16:9 still image, this means that at the same ISO step, pixel noise from a video frame and from a still image will look very similiar. Of course, using only every 6th pixel looses 2.5 EV stops in low light performance compared to ambitious supersampling approach. However, even 1/6th of the surface of an APS-C sensor is still a lot larger than the combined surface in dedicated 3 chip HD camcorders. So, videos in low light will look good. It is just that they could look even better. 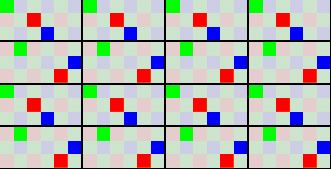 As you can see, the submatrix forms a pattern repeating every 6x6 pixels. Only 6 pixel values are picked from such a 6x6 area, producing 2 RGB pixels, e.g., as outlined by the black boundaries. To tell the truth, Pentax applies a little bit of demosaicing magic and produces 4 RGB pixels from the information of 6 raw pixels. However, it does it in a rather bad way leading to the (arti)fact that two horizontally adjacent RGB pixels have very similiar values, almost reducing the advertized resolution of 1536x1024 down to 768x1024. In part three, however, we will see that part of the information is still there. We'll call this effect the "768-aliasing artifact". You can see the fringe effect which is exactly as wide as the 6x3 subsampling matrix (2 pixels in horizontal direction). Also, K20D and K-7 share almost the same subsampling matrix, with a bit less of the "768-aliasing artifact" in the K-7. There is a simple experiment that demosaicing of the subsampling matrix is very rudimentary indeed: Pierce a tiny hole into a black cardboard, position the K-7 on a tripod ~10 m away and zoom into the hole image using 10x zoomed live view. 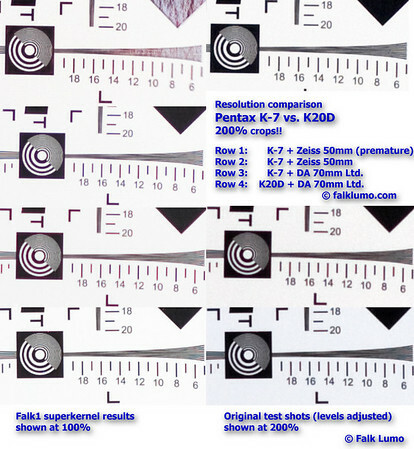 With a sharp lens, at most a single raw pixel in the subsampling matrix is hit only. What you see on the rear screen, is an image of the hole which is either dim or bright, in an arbitrary color, depending on minor movements of the camera. The hole is dim if a raw pixel which doesn't take part in the subsampling matrix is hit. So, to summarize, some fringe (false colors) and jaggy edges are artifacts resulting from the way video frames are extracted from the sensor. Note that the effects are much less visible in 720p which is supersampled from the 1526x1024 feed. The K-7's 720p video quality is stunning. You may look at the 1536x1024 recording quality as being the "raw image equivalent" for 720p final images. Needing post-processing but retaining extra headroom. Another common problem with video in dSLRs is the rolling shutter. Because the mechanical shutter is too slow for 30 fps, it stays open all the time and an electronic shutter is used. In the K-7, the sensor is read-out line by line in progressive order, bottom edge first, within a period of ~1/30s. Because the image is projected head down, the lines at the top of a final image have been read-out earlier than the lines further down. If the camera is panned, e.g., left to right, then vertical lines become slightly skewed, e.g., tilted anti-clockwise. Therefore, this effect is called skewing effect or jello effect as well. As for the K-7, this effect is very well controlled. The skew is exact and without extra jagginess. I.e., the read-out is uninterrupted. Very good! If combined with a bit of motion blur, it becomes almost invisible. I would say that the rolling shutter is almost a non-issue with the K-7. Combine this with the lack of motion-compression artifacts and a gray filter maybe, and the K-7 can produce really stunning panning action. Another strong point is the selection of high bitrate MJPEG as the compression codec. Not being an amateur's first choice, it offers greater headroom for post-processing. 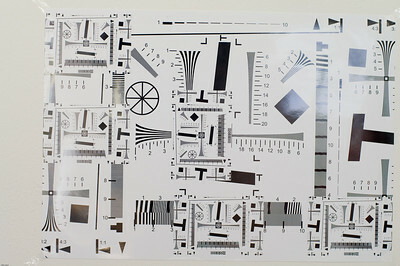 Individual frames are JPEG-compressed and about 200 KBytes large. 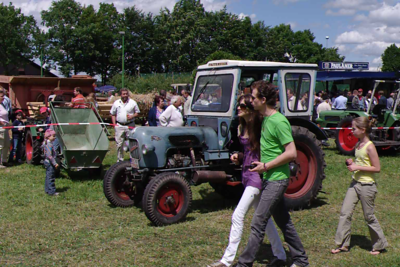 The JPEG compression artifacts are visible on larger than 100% inspection but don't disturb. Also, MJPEG is an easy format for post-production. And, it doesn't cause extra burden on the in-camera processing engine. The container is "Motion JPEG OpenDML AVI" and can be opened on all platforms, e.g., using Apple Quicktime. Of course, for long-term archival, MJPEG needs to be recoded (e.g., to MP4 AVC) to save space. The K-7 has a built-in mono microphone capturing a clear sound in the absence of any wind. It does have a plug for a stereo microphone too. I tried the RØDE Stereo VideoMic connected to the flash hot shoe and it produces excellent results. It plays back audio over the built-in speaker which is really bad, though ;) For decent audio in the field, one would require an HDMI-capable field monitor with a headphone jack. Yes, I checked that audio is played back via HDMI. The audio quality seems to be good too. The format is 1 or 2 channels of 16 Bit, 32 kHz PCM. After 5 - 30 minutes of continued video recording, a red thermometer pops up on the rear screen and informs about increasing temperature. I didn't have any recording stopped by temperature alert. 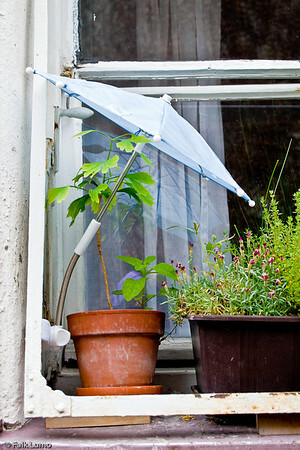 But it may be a concern in very hot regions, full sun shine and for extended scene recording. (Update) I've test-driven continuous video recording at 27°C ambient temperature for 40 minutes. The red thermometer appeared after about 15 minutes. But the camera didn't interrupt. The camera felt warm and burned one out of three battery marks. A still image shot at the end was ISO 800 and 40°C. It shows a very faint vertical line in the middle, about as pronounced as the ISO800 noise and only visible against a uniform background at 100%, invisible in normal photography. Even invisible against the uniform background are additional vertical lines exactly 256 pixels apart. I don't consider this hot temperature banding to be significant considering it is from a pre-production sensor. Other observations: right after movie recording with temperature alert, the camera refuses to enter LV but still enters movie mode and continues recording movies (or allows still images using the viewfinder). Only 20s after movie recording, it accepts LV again, incl. the red thermometer. After 2 minutes, the red thermometer has disappeared. This shall conclude Part I. Next will be a discussion about making the K-7 video feature more accessible for real projects. On my way back home today, I ran into the preparation for a public catwalk in the streets of Munich. 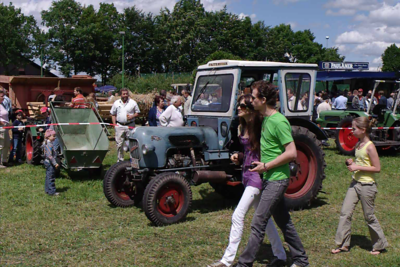 More precisely, Glockenbach quarter which is pretty known for cool events like this. For the curious: the fashion designer and store owner is Svenja Jander, a cool new designer. Looking at some of the missed photos again, many have motion blur actually. Despite flash and 1/100 - 1/180s ... If you look at some of the photos below, you can feel the motion, actually. One more comment about the photos you're going to see below ... They are all (sometimes heavily) processed and/or cropped and (except for one unprocessed original). My aim was not to reproduce what I saw! The photos are not meant for measurbation (if spelled correctly). I present them more as an illustration of what I could artistically achieve with a K-7, a DA40, a Sigma flash and little preparation. Others may do better. 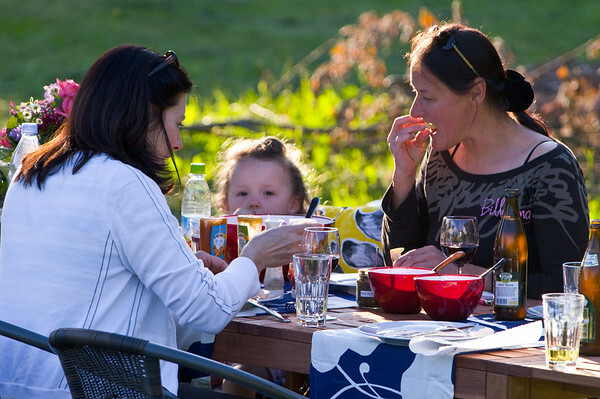 A 100% crop (when clicked) of the photograph above. This blog article was initially meant to be part of the noise article. However, the matter turned out to be much more intricate than I thought (and somehow, it still is). So, I made it a separate article again owned by falconeye. In the top of the article, you see a (synthetic -- more on this later) resolution test shot for the K-7. Please, click on it and open it in original size, and scroll to make the center visible. 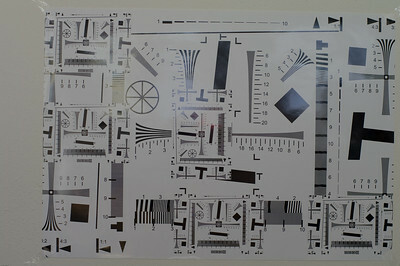 Note that what you see is the inner part of a special edition of the ISO 12233 test chart. Special because it contains insets of 4x resolution. 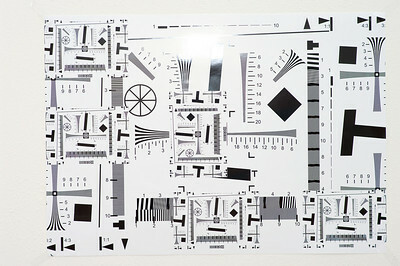 I made this edition to be able to measure today's dSLRs. 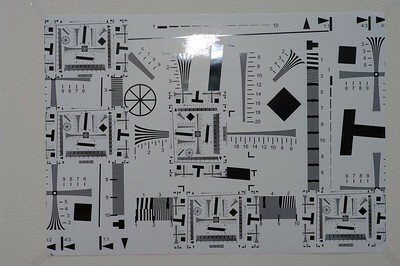 It is printed in A2 size and the printer's dots start to form Moiré at figure "8.5" in the chart insets, i.e., between "8" and "9". No big deal, just something to keep in mind. Also, note that the test chart only fills 86.7% of the picture height. As a consequence, the chart figures have to be multiplied by 460 (rather than 100) to yield LW/PH (line widths / picture height). Read, the K-7's Niquist limit is at chart figure "6.7". There shouldn't be any structure beyond this number. Now, look at fields labelled "7" or "8" (we ignore "9" and higher for the reason given above). There still is structure but it is just Moiré, not the proper line pattern which is printed. So the lens plus AA (anti-alias) filter outresolve the sensor and we pick up a pseudo pattern which basically is a sampling error (which is what is called a Moiré pattern). Would lens plus AA filter be at the sensor resolution or below, than we would have uniform gray fields labelled "7" or "8". Now comes the tricky part. Because we want to compare with the K20D which we must assume does have an AA filter which allows to outresolve the sensor, too. How on earth shall we measure a resolution beyond the sensors' capabilities? If I a had the accuracy and software of a testing lab at my disposal, I would extract these numbers from subtle details in the respective MTF figures; but I don't. Ok, let me get serious now (which means that most likely, you're gonna run away before the end of the article -- just make sure to join in for the verdict ;) ). In order to study the AA filter's effects, I will apply a technique called superresolution. 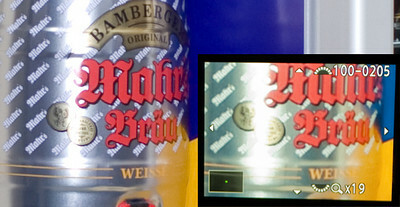 This technique involves taking multiple test shots (16 in this case) and creating a synthetic image at twice the native resolution, i.e., an 58 MPixel image! In order to construct this image, a "kernel" (deconvolution with a native pixel's PSF (point spread function)) is involved. By pure accident, I happen to have a kernel which rendered me good service with my K20D. Let me call this kernel "Falk1". I refrain from describing the exact procedure here... Let's just accept that, by some miracle, we now have test images at twice the resolution. Because they are so large, I will only present crops (200% crops = 100% crops of superresolved image). Let's call them supercrops. First, for the K-7, next for the K20D. Now, we see 5 rings and we suddenly see a difference, too! However, let's be cautious. The K-7 image has some artifacts. In the K-7 supercrop, the lines have more false color and more interestingly, the end of lines have a bubble artifact. E.g. look at the "5". From my experience with the superresolution method, this is a strong hint that the kernel (Falk1) overcorrected (similiar to the artifacts from oversharpening). While undercorrection just leaves some softness, overcorrection can have more funny effects ;) The assumed PSF was too wide. With a narrower PSF (Falk2, to be developped now ;) ), the supercrop would have looked better. From this, I am going to conclude that the AA filter in the K-7 is a tad weaker than in the K20D. This would also easily explain the pick-up of some false color in the demosaicing process. But let's assure that this is a very subtle effect. Just any microscopic change in focus will add the softness required to make K-7 supercrops look like K20D supercrops. Here is an example from an earlier (premature) series I shot while doing the noise tests. 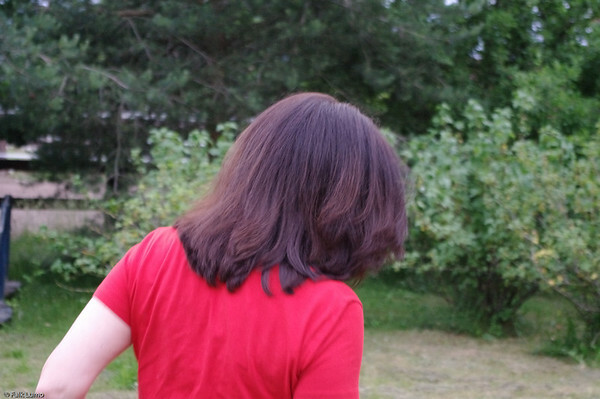 Now, the difference is gone. The images are with a Pentax DA 70mm Ltd. at f/5.0. Except for the last, shot with a Zeiss 50mm at f/4.0. 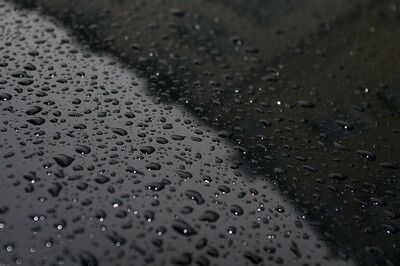 And I did verify that a Zeiss 50mm at f/4.0 produces the same bubble artifacts when in precise focus. Interestingly, the unaltered sample image from the K-7 looks just a tad softer than from the K20D. Which is why I showed a third sample (with the Zeiss) to verify that this is within a range of insignificant variation. This is the reason why I consider the matter to be intricate still. Some samples tell a different story than other samples ... But it is all in the subtle details, anyway. 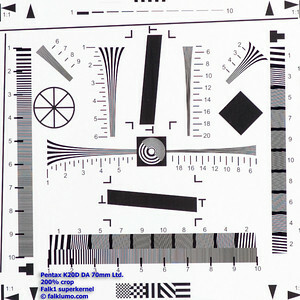 Pentax K-7 and K20D both have an AA filter of very similiar strength. It is pretty hard to say which one is weaker. I take my bet and say the K-7 has the weaker AA filter. But by just so little that in almost all normal shooting conditions, I expect to see no significant difference in practice. The above image summarizes the data this verdict is based upon. Please, visit for further details. Myself (and I know of at least one other alpha tester as well) have been wondering why the images on the rear screen, when magnified after the shot, don't look as crisp as with some other makes. One could think that the images are a bit soft. So, I made a test and compared the magnified image on the rear screen with a 1:1 crop as developed by Lightroom with default settings. As you can see, the image on the rear screen, when magnified after the shot, does indeed look a bit soft. Even if it is perfectly crisp on a computer screen. I verified that this holds true for in-camera JPGs as well (to a slightly lesser extent). I think that this is something to keep in mind when working with the K-7. Even though it has a VGA screen and goes up to 32x magnification, it never shows the pixels. Probably a feature rather than a bug;) This may have been part of early rumors that the K-7 produces softer images than the K20D. My tests have not been able to confirm this. Thanks for your patience and interest. Today, I found the time to shoot images from a K-7 and a K20D side by side. In this article, I will highlight the differences in noise between the two cameras. This is particularly interesting because Pentax used a 2nd generation version of the sensor used in the K20D, a 14.6 MPixel APS-C sensor now famous for its beautiful images when used with an excellent lens. 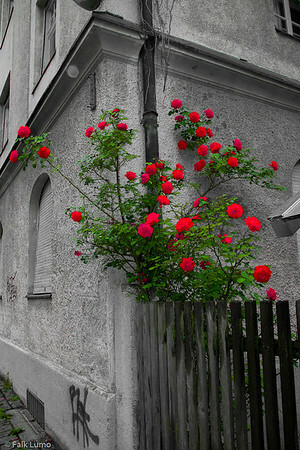 I am not interested to compare the advances in the camera's built-in JPG engine and its noise reduction (NR) algorithms. I am sure they are significant. I am interested in the best quality I can get from the camera, i.e. from RAW. 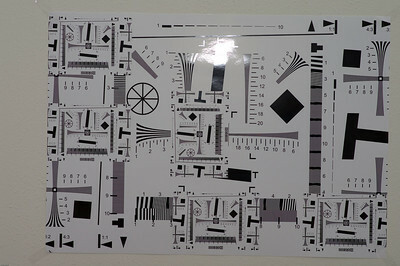 - My "special" 400% ISO test chart on a wall. - Constant exposure at EV 9. - Again, underexposed by ~ -0.7 EV to exhibit more visible noise (to make it "gray"). - Second image underexposed by ~ -1.7 EV (EV 10). - Tripod, K-7 MLU and K20D 3s timer, both via remote control. - Focus series for a resolution test (pending). - Late sun and wood floor made a nice 3900 Kelvin color temperature. - Shot in RAW (K20D: PEF, K-7: DNG) and exported by Lightroom using default settings. - Focus was only almost perfect in the noise test. - Only one camera of each type tested. - My camera is a preproduction unit (with final firmware) which may give slightly inferior results to a production camera. Therefore, subtle differences may not be significant. The interpretation as authorized by Pentax is as follows: Tests carried out with preproduction units and final firmware are allowed to be taken representative of final quality. There won't be a noticeable difference when just inspecting photographs. However, there may be numeric differences when tests are carried out by a quantitative lab test, and if so, in favour of the production cameras. Therefore and because I didn't publish test figures, this blog article must not be considered premature. Please, have a look before joing my conclusion (note that you'll see snippets magnified by 15x!). There is no significant difference in noise from black & white subjects in raw files from the K-7 and the K20D. The K-7 produces excellent results up to ISO 1600, and ISO 6400 remains reserved for smaller image sizes. It is however remarkable how much detail is preserved in even ISO 6400! This is what Pentax is known for: Details rule over noise! I have just received the final firmware v1.00 and wanted to make available some samples shot at ISO 400-6400 in tungsten light (2900/2950 K, using Auto WB). Shot with the kit lens and AF focussing onto the SD card in the center. This is a preliminary article and my evaluation of noise is pending. Also, the subject is not ideal (colors missing, no gray card). I was in a hurry. The ball's surface has a subtle texture looking like noise but not being noise (in iso 400)! So, this may be used to compare denoising artifacts. The camera was set to "natural" (default is "bright") and default settings otherwise (i.e., sharpness -1, NR medium, NR start iso800). Preliminary test, firmware is final but the sensor in my preproduction camera is said by Pentax to be different from the final one! This is very warm tungsten (below 3000 Kelvin). In daylight, the noise would be much less. Also, ISO6400 is not a fully advertized feature. 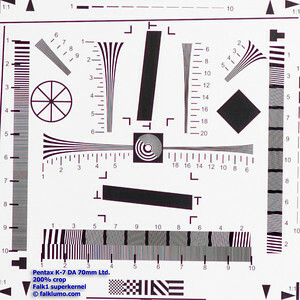 Pentax claims to have improved the autofocus system in the K-7. It is now called SAFOX VIII+ and has an additional sensor to improve accuracy in tungsten light. So, I had a close look at the autofocus system in AF.S mode, the mode normally used to achieve highest precision. A thing which I didn't do: I did not look into automatic selection of AF points. I've always used the center AF point (the K-7 has 11 AF points, which 9 are cross sensor of). The K-7 turns the screw drive focus motor faster than the K-m. A complete drive-thru for the kit lens at 55mm is only 0.18s! This is 40% faster then the 0.25s of the K-m which is fast already (cf. table given below, first row). A overall cycle of the autofocus hunting for impossible focus is 0.81s (down from 0.94s). Interestingly, the K-7 still waits for the exact same 0.45s before hunting back (0.81s = 2 x 0.18s + 0.45s). So, the K-7 has a stronger focus motor to start with. It will not have a big impact in most situations where the focus won't travel much. And SDM lenses with their built-in ultrasonic motor won't see the difference anyway. 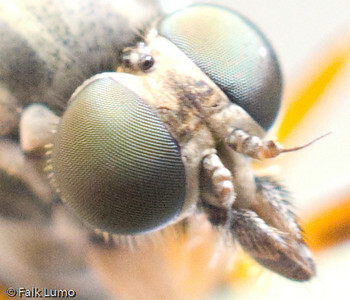 When going from 6x to 8x/10x magnification in live view (only possible with manual focussing), the quality of the magnified image is enhanced (e.g., less noise!) and visibly outperforms the quality known from the K20D. Other lenses like 40mm, 18-55mm kit lens, 16-50mm, 300mm have all been focussed to "the point". At least for my test camera (which may have been manually adjusted, of course) I have been very happy with accuracy. This includes shots in tungsten light which produced correct focus as well. Note that many Pentax users are more keen in exact focus rather than fast focus because this is what renders the ultimate image quality the K-7 with its almost 15 mega pixels is capable of if combined with some of the good glass Pentax is known for. The only caveat is the rear display which will not create the illusion of overly sharp images except if taken with very high contrast. It requires a bit of experience to verify focus. However, the quick view zoom is fast and this is not a big issue at all. Sometimes, the contrast AF achieves focus where the phase AF doesn't and vice versa. E.g., the contrast AF is able to focus onto a white wall or a computer screen displaying a white surface only. Obviously, it is able to find sufficient micro contrast there! Phase detect AF systems are known to fail in these situations. In order to measure the speed one has to define the amount of light a scene is lit with. It is a knwon fact that below a certain threshold, phase detect AF systems cease to work. Therefore, they may feature an AF assist light illuminating a very dark scene. The K-7 has a green one and it is bright enough to disturb if used towards people. Fortunately, the K-7 only uses it in very dark situations, a lot darker where a Nikon D300 would already invoke its own assist light. In all my tests below, I switched it off! When comparing to a K-m it becomes obvious that the AF algorithm is almost the same, only faster. 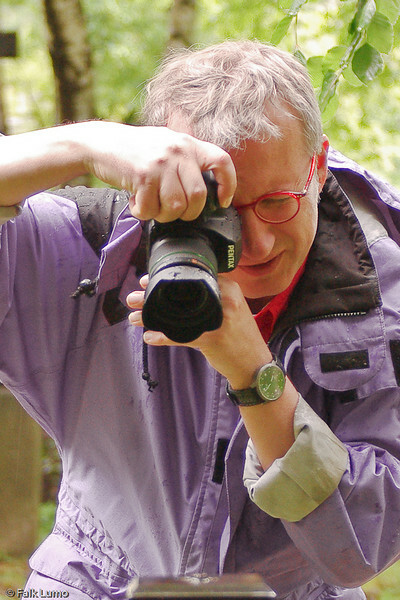 It would still focus in 1, 2, or 3 tiny steps to aquire perfect focus. The table below will give exact light values (LV) and temperatures of the lighting, in the same order. You can read more about light values here: Wikipedia on LV . 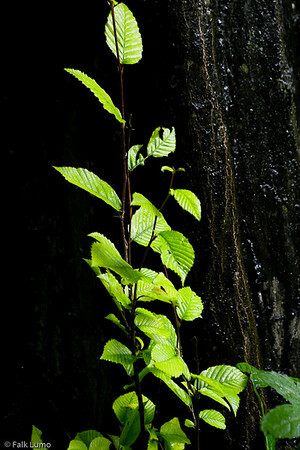 At ISO 100, exposure values EV and light values LV are the same. LV 0 is very dark and not normally met indoors. I measured LV by spot-metering a white sheet of paper (the target) and adding 2.47 stops to adjust for 100% rather than 18% gray. The correctness of exposure was verified by inspection of the histogram. Color temperature as given where 5500 Kelvin is daylight and less is warmer. The subject was a white sheet (A4) of paper about covering the frame, with a big cross in the middle painted by a 0.5mm wide black marker. The lens was the 18-55mm WR kit lens at f/5.6. I didn't check if the new WR kit lens is faster (has a shorter AF screw) than the previous kit lens. The AF speed was measured by analyzing the audio recording and taking the time from start of focus motor (the half button press is inaudible) till focus confirmation beep. The actual shutter noise you hear on the audio tapes is from the full button press at some arbitrary later time. As one can see, the focus motor delay is 135 ms and complete operation (shutter button to shutter release) is 515 ms (0.38s after focus motor activity). focus motor delay is unnoticeable in practice. In all following figures, the additional (short) delay before focus motor activity is ignored. Add 0.14s to all figures if you need the complete release latency. In all experiments, the lens was manually focussed to 35cm prior to first AF operation, then twice from the respective previous position. In all timings marked "~0s", there was no activation of the focus motor. The timings from such a series of up to 3 AF operations are separated by a semicolon (;) in the table below. Timings separated by comma (,) are for the same operation, but from different series. The subject was 1m (or more) away. For every result, you find a link to an audio tape of the sample, always exactly starting at the first button half press. The amplitude in those samples has been normalized. Don't use to compare shutter noise. Most remarkably, the K-7 was able to focus at 0.4 LV without focus assist light! It also seems to be about its limit as can be seen by the second refocus operation which succeeded (sharp image) but took almost 10s ;) The K-m couldn't focus at so low light and it seemed to need a full stop more light. At about 2 LV, AF was already quick and snappy needing about 1s for both cameras. In normal lighting conditions, AF was even faster, requiring about 0.4s where K-7 was somewhat more consistent. Overall however, it wasn't faster than the K-m. In normal lighting conditions and when the previous focus position is near the required one (the typical situation), the AF time goes down to a mere 0.3s and feels very quick and snappy. In available night bar light (~2 LV) I got the impression that both K-7 and Nikon D300 would need about 1s to confirm focus. I didn't take exact measures. The D300 "felt" more reliable though because it didn't noticeably re-adjust focus in the operation. My conclusion is that the new SAFOX VIII+ as deployed in the K-7 is a significant improvement over the previous installment (the K-m). The 40% faster focus motor and 1 stop extra performance in low light are well balanced with the overall improvement in the K-7 which has a faster shutter and 50% faster burst. The improved accuracy in tungsten light was asked for by many and as it seems, has now been delivered in the K-7. The K-7 auto focus isn't the revolutionary step some had hopes for. I.e., you will still be able to miss shots ;) But when actually shooting with the K-7, it certainly feels much better than just an evolutionary step. Numbers don't tell the whole story. This second part of the article about AF.C in the Pentax K-7 is based on experience in general and from a less controlled test situation. To speak in general terms, the continous autofocus in the K-7 is significantly improved over, e.g., the K20D. However, so far I know of no autofocus which is fool proof in very difficult situations, like nearby kids running around you wildly. This would require focus latencies well less than 0.1s. I estimate focus latencies for AF.S in the K-7 to be 0.3 to 0.5s, and AF.C may be about 0.2 to 0.3s. So, I decided to find out just how badly AF.C would fail in such difficult situations. I asked a friend to run "eights" around me, as close and fast as possible. I tried to make as many shots (hi burst) and counted how many good ones and acceptable ones I got. I used the kit lens at 55mm, f/5.6. To tell the truth, I missed to have the subject in center in a couple of shots and I had the AF set to use center point only. Because of the awkward testing situation, I decided to count as "good" what looked sharp at 1600x1200 resolution. And "acceptable" what looked sharp at 800x600 resolution. "Excellent" would be sharp at full 4650x3100 resolution. The photo at the beginning of the article shows one of the "good" examples from the K-7. I did the experiment with both, a K-7 and a K20D. 4 excellent, 5 good, 12 acceptable, 14 fail. 0 excellent, 2 good, 6 acceptable, 16 fail. Esp. comparing the excellent/good ones we see that the K-7 could actually capture some of the moments which the K20D couldn't. But it is certainly not fool-proof as well. I made another experiment, with the same setting, where I made the person running straight towards me, as fast as possible, starting from 25m away. 3 excellent, 12 good, 1 acceptable, 1 fail. 6 excellent, 2 good, 2 acceptable, 3 fail. With ~90% good images, the K-7 looks like a real winner. Of course, I found it a bit cumbersome that only 3 out of 15 good images have been tack sharp (less than from the K20D). Seems like the AF.C in the K-7 has a bit more shutter priority than in the K20D. Nevertheless, with only 60% good images, the K20D was no match for the K-7. This confirms my general observation with the K-7: in most situations, i.e. in situations where it would be straightforward to keep a moving subject in center will most images turn out sharp. If this is difficult and if one would have to rely on automatic AF field selection then the AF.C in the K-7 will most likely run into trouble too. Overall, the AF.C in the K-7 is a good match for its improved speed which is a ~70% improvement over the previous K20D. Speed and availability of low light autofocus (AF-S). Speed and hit rate of continous autofocus (AF-C) for fast moving subjects (aka action or sports). 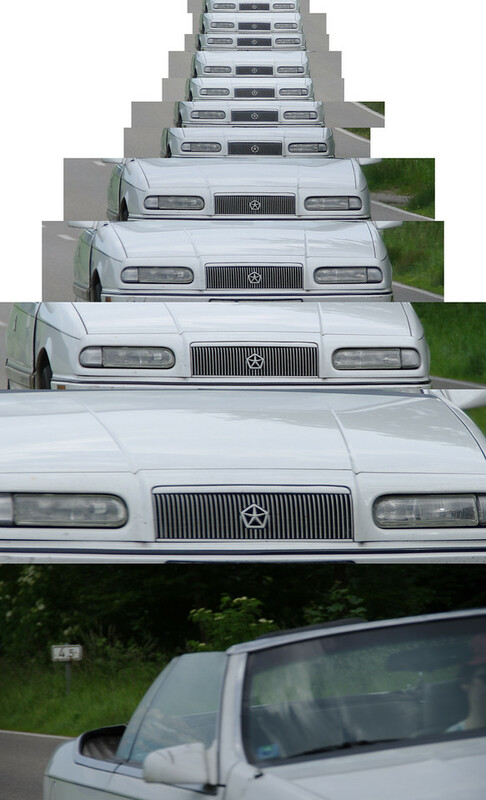 Continous shots (burst, continous AF aka AF.C) of an approaching white Chrysler LeBaron, tripod mounted and panned centering onto radiator grill. Photograph besides road. Road straight. Test done on a straight highway. Original: red Chrysler PT cruiser, closed military airport. Controlled speed: 100 km/h (62 mph). Starting photo burst at 100m distance (109 yards, 328 ft). Stopping when passing by. Time to drive through 100m: 3.6s. Focal length: 35mm equivalent of 200mm (DA 18-250 at 142.5mm/5.6). Light: Bavarian white blue sky. Changing conditions. Original: Daylight overcast with grayness. Constant conditions. Storage: JPEGs onto Sandisk Extreme III. So, some conditions had to be changed. Not necessarily in favour of the new setup (assuming that the DA SDM 50-135/2.8 is superior to the DA 18-250). At f/5.6, depth of field (DoF) is larger than at f/2.8. E.g. 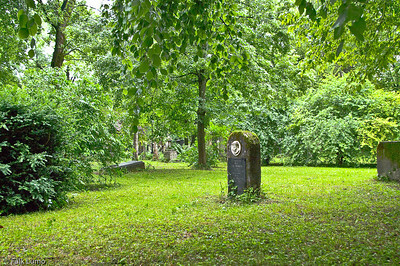 at 50m distance, it is 15.7m for f/2.8 and 33.9m for f/5.6. This may look like a big difference. However, the AP-C circle of confusion (20µm) is 4 pixels large and watching for 2px wide sharp edges means that we can compensate for this. Let's just require that 100% crops look pretty sharp. To have a point of calibration, I decided to test both, a K20D and a K-7. Disclaimer: I later discovered that I made the following mistakes in running the test. It doesn't ruin the results but should be taken into account: Fine sharpness set to 3 (too high); ISO in some runs set to 1600 (too high), others to 200 (too low); JPG noise reduction not turned off; JPG quality set to 4 stars (too high); driver not driving exactly constant speed. The problem with 4 star JPG quality is that not 38 (K20D) or 40 (K-7) images are shot in hi-burst but only about 17. The K-7 can (theoretically) shoot 19 images within the time a car needs to travel 100m (3.6s). More if one launches too early or the car is too slow. Fig.1: The 100% crop images for run #2 are all shown in the compound image above and these are the ratings: ++/+/++/++/++/+/++/++/+/+/o/- (last one was too near to have any chance, and last one is not a crop). Taking run #2, discarding the first 4 images (farer than 100m) and counting 2/4/1/1 as 6/2 we would roughly get at the same result. So, I decide to count the first two qualities ++/+ as "good". 14=13/0/0/1 correct speed and distance! Run #3 are 7% bad images only. And to quote a comparison: 13 good images is what the D300 delivered in the original test (rank 6/9)! Fig.2: The 100% crop images for run #2 are all shown in the compound image above and these are the ratings: +/++(8x)/+/++(3x)/o/+/- (last one was too near to have any chance, and last one is not a crop). The AF.C on the K-7, compared to the K20D, is an improvement making it significantly coming closer to the performance of a D300. How close exactly it comes, I don't know. Could be very close, or not. 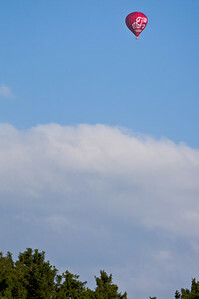 Today, when I looked out of the window, I saw a moskito on the other side. 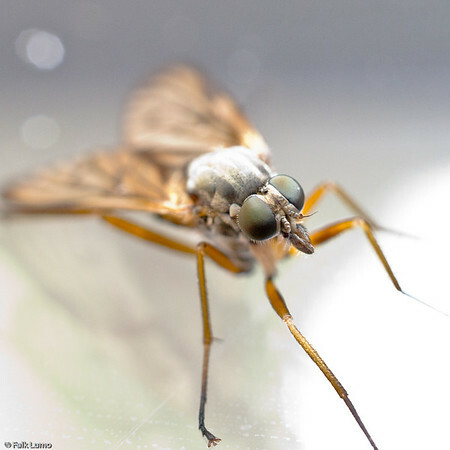 Well, a good opportunity to try out the K-7 with the DA 35mm Ltd. macro lens. What a wonderful lens! I noticed that autofocus starts to have trouble when exceeding about 3:1 magnification. I think this is normal because with the DA35, the distance of front lens to subject starts to change dramatically as well. So, I used live view to focus manually and actually had to magnify to 10x and shift the region of interest on the rear screen (I couldn't get the moskito into the center of frame). This worked out nicely. The full 640x480 resolution of the display certainly is a benefit. Below, I add a 100% crop too. It is from the unprocessed original. The saturday after fetching my K-7 was a rainy day. I.e., a perfect day to go out and do some test shots! This allowed me to get aquainted to the K-7 more and also enjoy shooting in bad weather conditions. As noted by many on the web already, it is a real pleasure to hold and handle the K-7. In comparison, the K20D feels older than the core technical data would suggest. It feels solid, almost unbreakable and seems to offer timeless value. Of course, no dSLR can offer this with progress in semiconductor physics being this fast. Nevertheless, the K-7 just feels "right" -- as a serious photographer's tool. I like its size. It is rather small for what it does (smallest APS-C semi-pro body in the industry, look up the technical specs) but does not feel small because of the excellent grip. I could carry it around just holding its grip, for hours ... With its steel magnesium alloy body, it definitely feels solid rather than hollow; giving a nice balance to most lenses. The first observations jumping to mind are: It does focus fast, it does shoot fast, and it does it in stealth mode (all compared to, e.g., a Pentax K20D or K-m). The shutter and mirror slap are so quick, silent and damped that it one wants to press the shutter in burst mode just for the joy of it (and my girl friend likes it too). Also, the live view (LV) operations are now fast enough to actually be useful. The K-7 is a lot faster to operate though without LV. Of course, for most discrete usage, the constant mirror up during LV, combined with SDM or manual focus, is an added benefit. Unfortunately, the mirror will unlock after a while, in some way or another. Also, on first inspection, the image quality is very good. With the excellent image quality of the K20D, this is no surprise. I cannot yet tell if it is better or worse, though. In general, I'll try to add to what has been posted already and not repost too much. Note: all photos as shown here are post processed. The gallery contains the original images, too. Please, visit the gallery page to access full size sample images. All original images have been taken with the camera's factory settings, in DNG raw format, and been converted to JPG in Lightroom with standard settings. You may download and print the original files but please note that the photos carry my copyright.